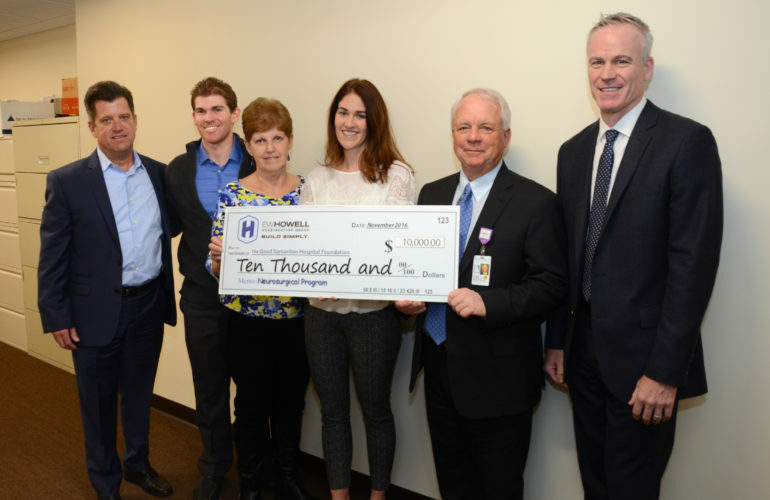 Members of The John Bergin Benefit for a Friend presented a $10,000 donation to the Good Samaritan’s Neurosurgical Program on November 15, 2016 in memory of John Bergin. John was a Senior Vice President at E.W. Howell Construction Group and one of the founding members of the Benefit for a Friend, a charitable organization sponsored by E.W. Howell that helps local families in need. Mr. Bergin received treatment at Good Samaritan Hospital earlier this year before his death in May 2016. His family – son Bryan Bergin, wife Rosemary Bergin and daughter Lauren Bergin-Novellano — was also in attendance to present the donation. From left: Paul O’Rourke, E.W. Howell Construction Group; Bryan Bergin; Rosemary Bergin; Lauren Bergin-Novellano, E.W. Howell Construction Group; and Thomas Ockers and Dr. Kevin Mullins, both of Good Samaritan Hospital.